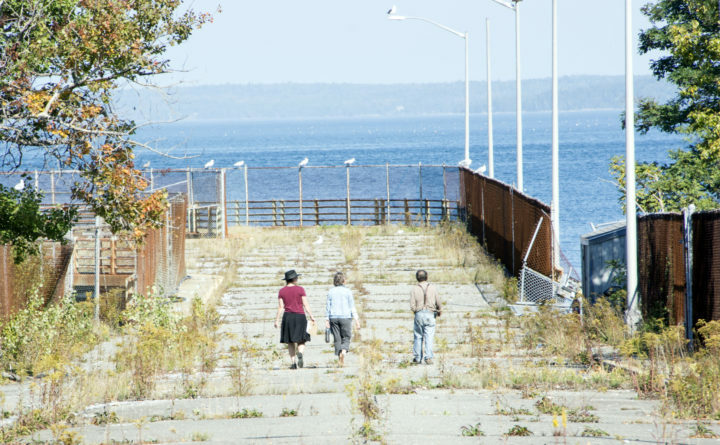 Anna Durand (left) and Pancho Cole (right) and an unidentified member of the Bar Harbor Ferry Terminal Property Advisory Committee check out the property during a site inspection on Sept. 27, 2017. Operating a multi-use marina will be expensive if not money-losing for Bar Harbor should residents vote to buy a former ferry terminal for that purpose, according to a Florida-based consultant the town hired. Posted Wednesday on the town’s website, a 51-page business plan from Bermello Ajamil & Partners Inc. of Miami offers detailed financial breakdowns of 28 specific options. Of the 28, 18 lose money after 20 years of bond paybacks, with losses estimates ranging from $106,000 to $17.5 million. And the 10 money-makers rely upon heavy cruise ship tendering and international ferry traffic to make $124,000 to $6.3 million — again, after 20 years — with no commitment yet from the cruise ship or ferry industries, Town Manager Cornell Knight said. The $3.5 million terminal purchase plan, which Bar Harbor residents will vote on next month, is part of a challenging issue — what the town should do to alleviate growing cruise ship and ground-based tourist visitation. Bar Harbor residents have expressed hope that turning the former Bay Ferries Limited site off Route 3 into a marina would reduce crowding in the harbor and downtown, which are about a mile away. Bay Ferries owned the terminal until ending its Bar Harbor service in 2009, but has expressed interest in returning. “Perhaps the town will want to work out a plan for meeting these costs,” Knight added. Townspeople will get their first crack at reviewing the report when the Town Council meets at MDI High School’s auditorium at 7 p.m. on Monday. According to the report, Bermello Ajamil based its work on recommendations from the Ferry Terminal Property Advisory Committee. The recommendations included easing downtown vehicle traffic on cruise ship days, creating public access to the sea, and consolidate cruise ships, buses, taxis and Route 3 traffic at the marina while developing the marina as a viable commercial and recreational site. Bermello Ajamil examined three alternatives ― doing a marina with cruise ship tendering and a ferry service, without one, or without both. The most profitable alternatives involved permitting exclusive marina access to one of three cruise ship companies. The companies are represented in the report by the percent of total cruise-ship traffic they bring to Bar Harbor, namely 20 percent, 34 percent or 40 percent of that traffic, Knight said. The larger companies are thought to be less likely to seek that access, Knight said, although others have said that the cruise ships have expressed no interest in using the marina to tender traffic. Bermello Ajamil anticipates $328,742, $610,814 or $733,279 in annual revenues to come from each company. Officials at Bermello Ajamil, Town Council members Judie Noonan and Matthew Hochman, and representatives of groups that oppose increased cruise ship traffic declined comment on the report, saying they wanted time to study it further or would comment on Monday. Knight said that the public review of the report would take at least a month and encouraged residents to take their time reviewing it. Bermello Ajamil has offered to identify potential alternative funding options, such as state or federal grants, and to determine how to proceed with site buildout, if the purchase is approved. Bermello Ajamil describes itself as one of the top international maritime, aviation and transportation facility design firms in the world. Headquartered in Miami, the firm operates on six continents from offices in Florida, New York and Denmark.